Sub: S.E- SCERT, AP- Course No. 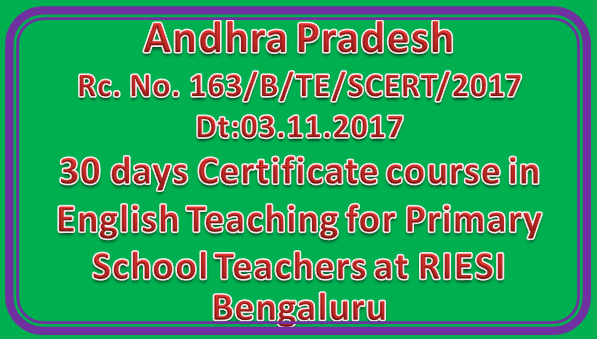 16,- 30 days Certificate course in English Teaching for Primary School Teachers/Teacher trainers teaching 6th,7th, 8th froml4.11.2017 to 13.12.2017 at RIESI Bengaluru -Deputation of teachers- Req-Reg. Ref: Lr. No. RIE/TRG/CELT/Pry/Member States/2017-18 DT: 03.11.2017 from Director RIESI, Bangalore. The attention of all the District EducationaL Officers in the State is invited to the reference read above and they are informed that the Director, RegionaL Institute of English, South India, Bangaluru has requested to depute 30 High/Secondary School Teachers/Teacher trainers from different districts who are teaching EngLish at the primary SchooL Level teaching and to depute them RIESI BangaLore to attend the 30-day CELT Programme from 14.11.2017to 13.12.2017 at Jnanabharati campus of Bangalore University, RIESI, Bengaluru. Therefore, they are requested to identify (3) Teachers (EngLish) for each district of who are teaching EngLish at the primary SchooL Level teaching 6th,7th,8th below the age of 50 years and not undergone the said CELT training earlier from Govt. Schools, ZP SchooLs, Models SchooLs etc., and furnish the List to this office so as to enabLe this office to transmit the List of (30) participants and reserve list of (10) participants to RIESI Bangalore for above said the 30 day CELT Programme from 14.11.201 7tol 3.12.2017 at Jnanabharati campus of BangaLore University, RIESI, Bengaturu.